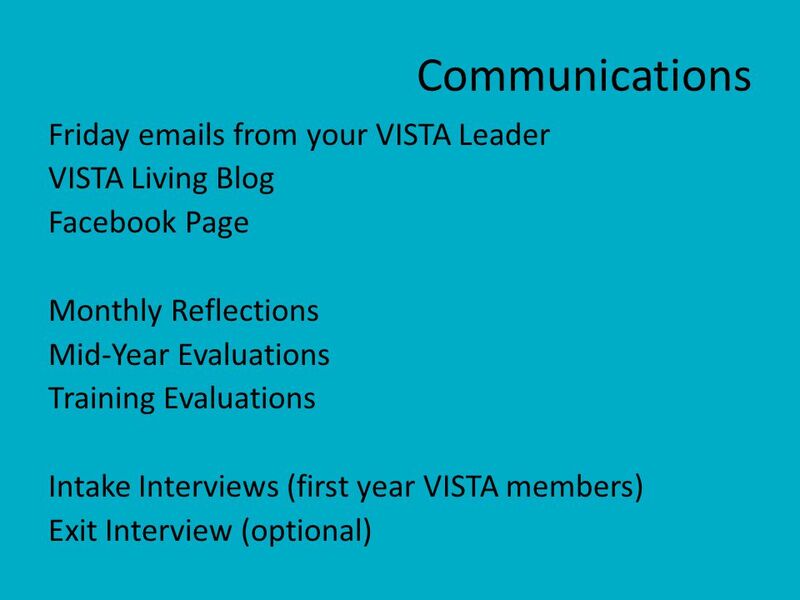 Making the MOST of your Year Benefits beyond AmeriCorps VISTA basics. 4 Volunteering Volunteer at your site! 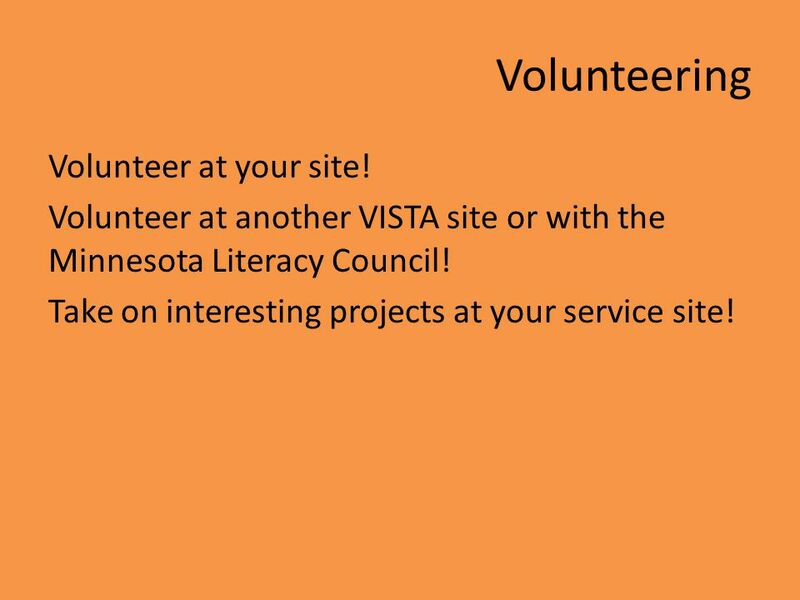 Volunteer at another VISTA site or with the Minnesota Literacy Council! Take on interesting projects at your service site! 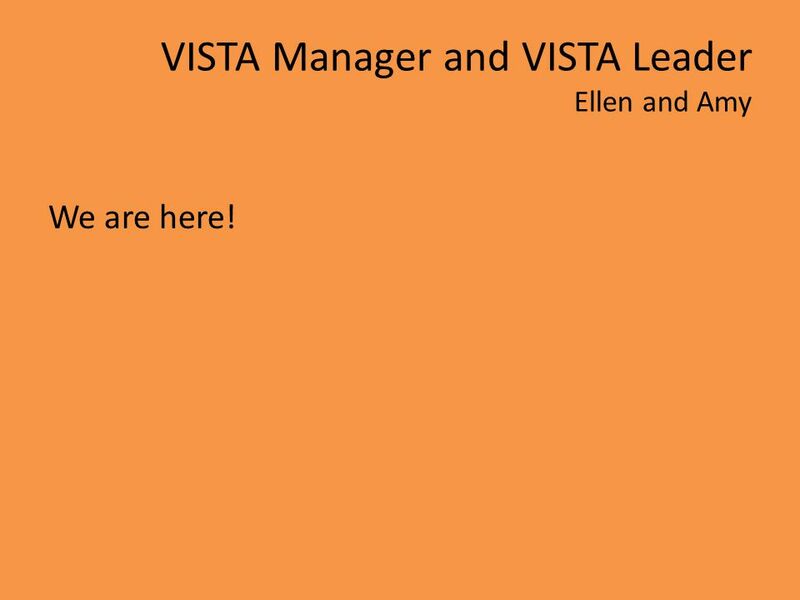 8 VISTA Manager and VISTA Leader Ellen and Amy We are here! 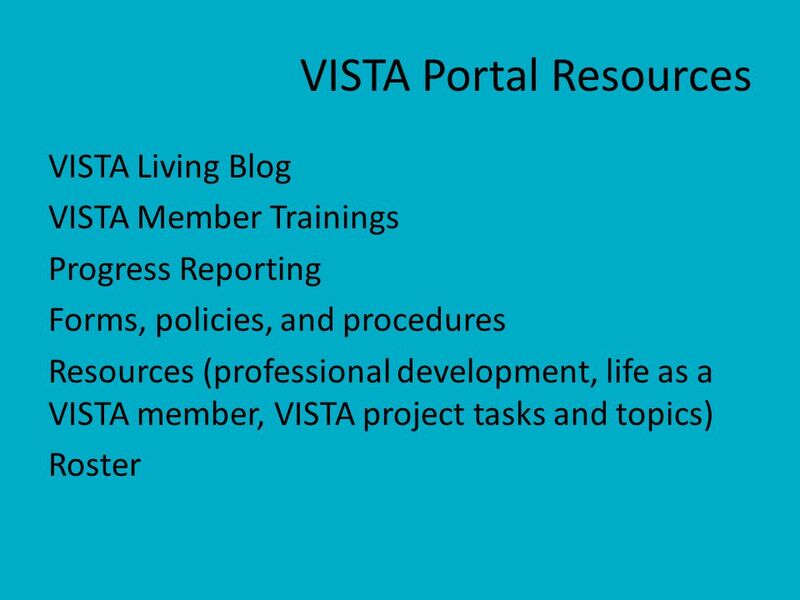 9 Peer Groups Peer groups within the larger cohort encourages collaboration, resource sharing, and relationship building among VISTA members. 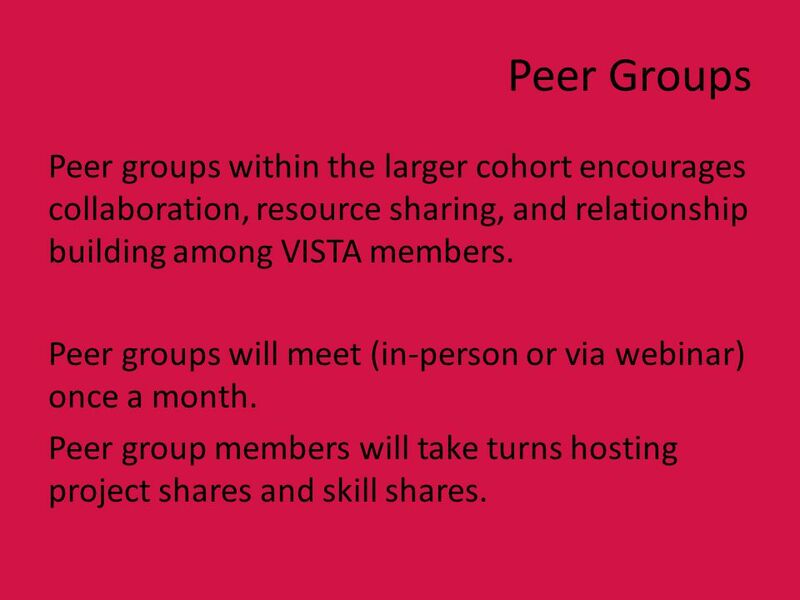 Peer groups will meet (in-person or via webinar) once a month. Peer group members will take turns hosting project shares and skill shares. 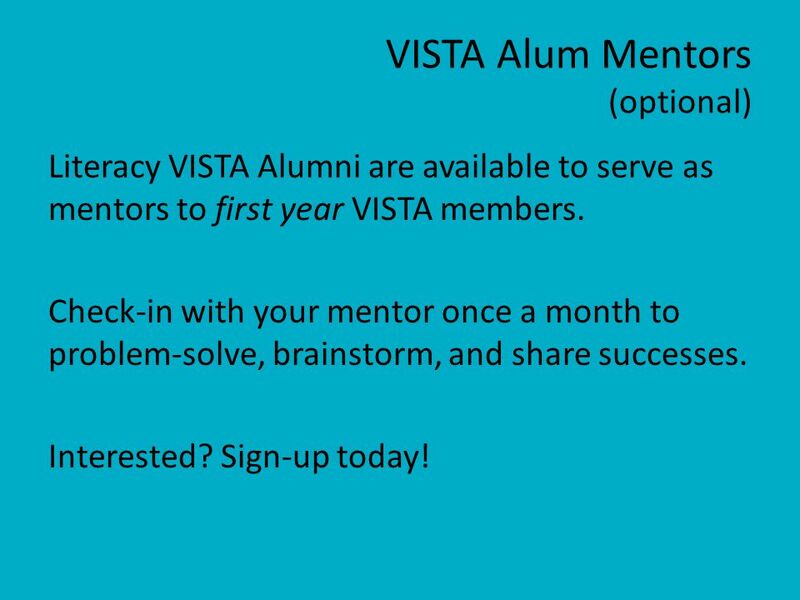 10 VISTA Alum Mentors (optional) Literacy VISTA Alumni are available to serve as mentors to first year VISTA members. Check-in with your mentor once a month to problem-solve, brainstorm, and share successes. Interested? Sign-up today! 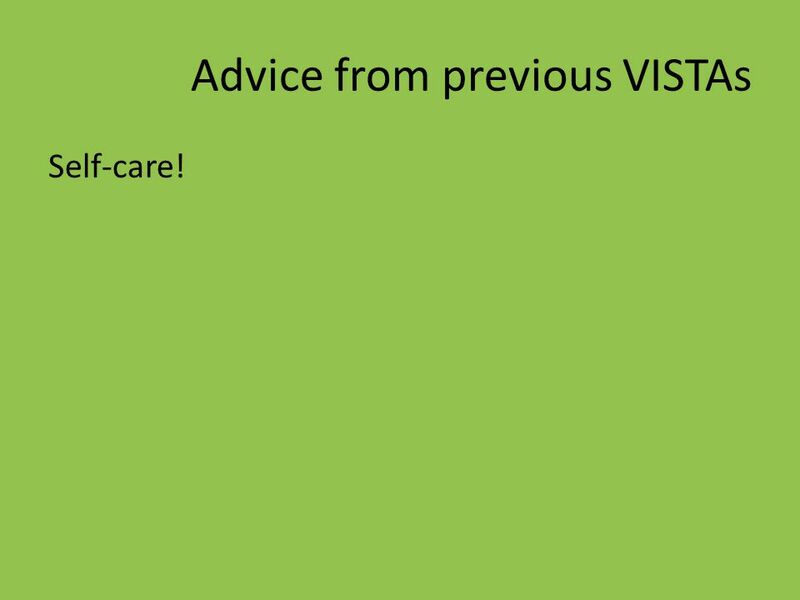 11 Advice from previous VISTAs Self-care! 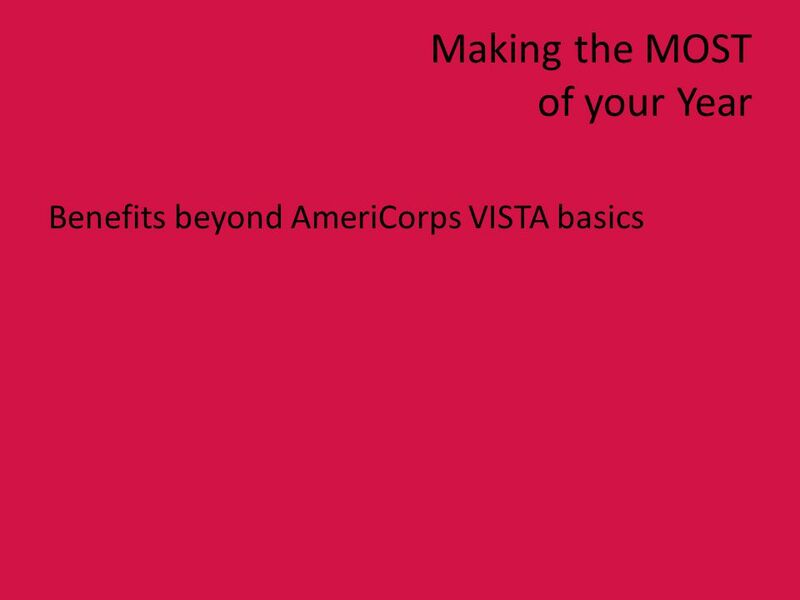 Download ppt "Making the MOST of your Year Benefits beyond AmeriCorps VISTA basics." 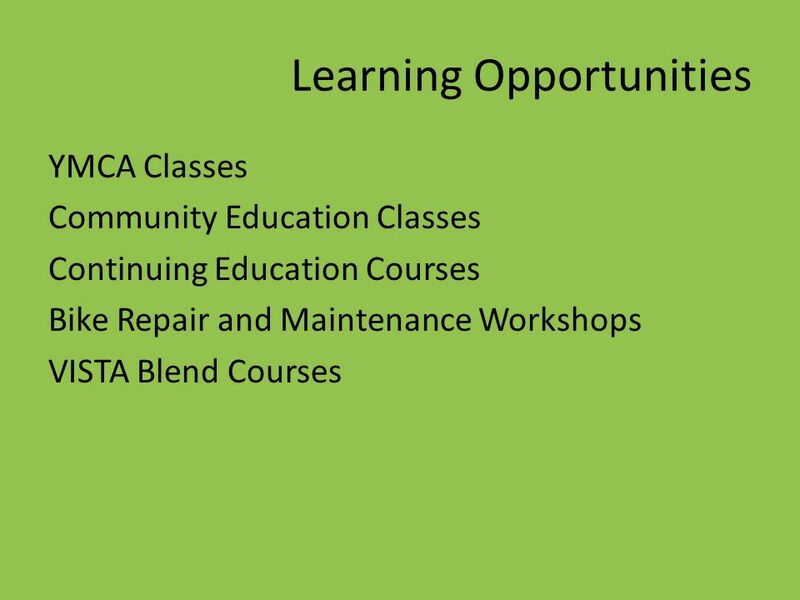 Tools and training for volunteer and service programs The Resource Center. + Partners for Learning Assessment Exploration. + Overview Introducing Partners for Learning Assessment Exploration Sorting out what we do Finding out. 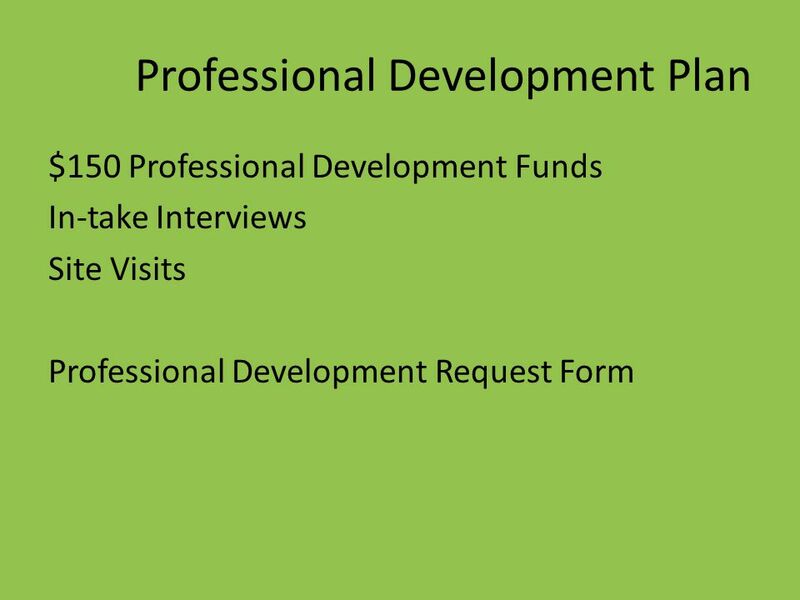 PQF Induction: Small group delivery or 1-1 session. SPRING 2013 Service-Learning Orientation. Thank you for choosing to serve! LEEP Projects 3.0. What are LEEP Projects? 2 Summer experiences Offer real-world application of course material Allow authentic problem-solving experiences. GEAR UP Idaho  GEAR UP Idaho is a federal grant program that provides comprehensive, early intervention college access programming to selected Idaho. Goodwill Easter Seals of the Gulf Coast Community Presentation of Legacy Corps Program. 1. How grants enhance Cooperative Extension’s mission and outreach 2. 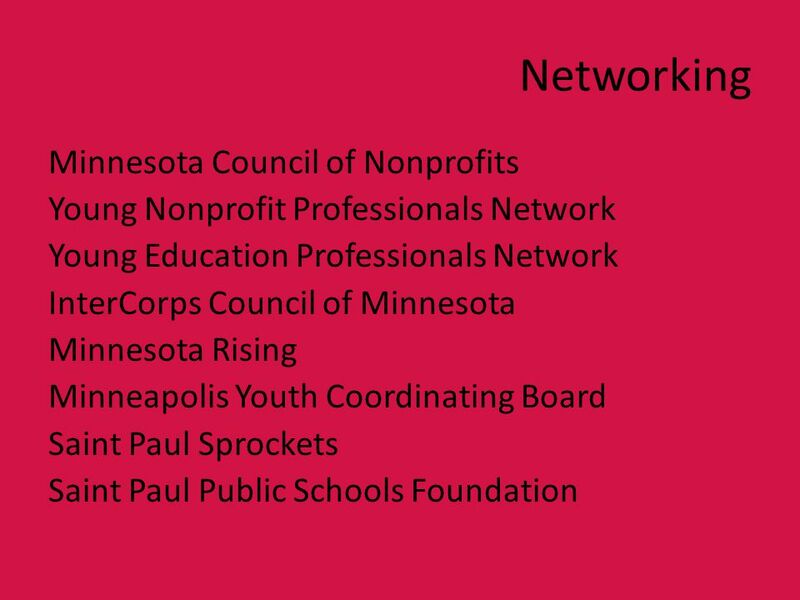 How grants enhance your professional development and career 3. Building partnerships. 1. AmeriCorps*Texas: Stories of Transition, Training and Inclusion Suzanne Potts, LMSW, MPH Senior Program Officer, OneStar Foundation 2. 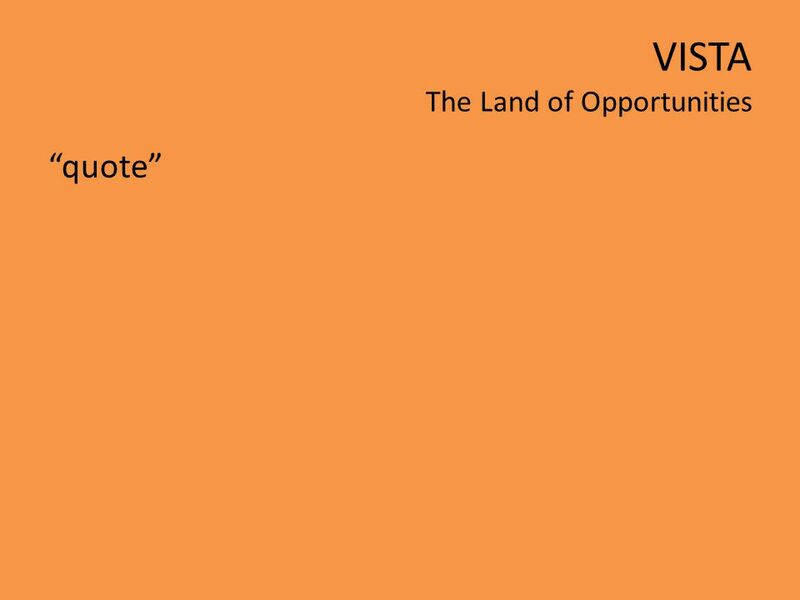 Leaders of African-Descent Power of One Mentoring Program Presented by: William Nixon, VP of Operations - Professional Development. Welcome to the Parent Involvement Resources for Illinois Families and Schools webinar Presented by: Joseph Banks, Illinois State Board of Education Gail. Oregon Alliance for Early Intervention Retreat 2012. Sarah Thompson, E-Mentoring Coordinator Protégé Mentorship Program Orientation. 4-H Teams for Social Media: Youth - Adult Partners August 22 – 24, 2013 OSU Campus, Weatherford Hall & State Fairgrounds. CEDPA Alumni Coaching Program Definition Three aspects of coaching are generally accepted as universal: 1. The coaching process is an ongoing. Working with Students "The future of this movement lies with the young people.” – Millard Fuller. Treatment Program Alumni Services Coming of Age: Beyond the Picnics 39 th International Winter Symposium Harmony Recovery in the Rockies® Community & Alumni.